The Writing Prompt (WP) item type can be created in the Work Space and then used in an online Item Bank Assessment. 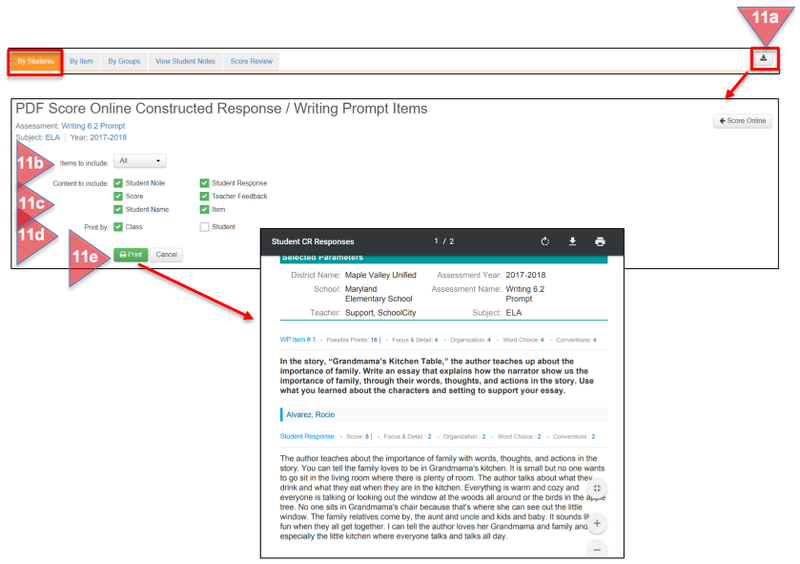 Students are provided a prompt to which they must provide a written response within the Student Portal. Teachers can then score the student responses using the Score Online process. Please see the Help document, Item Banks: Creating a Writing Prompt Item, for more information. From the Top Menu Bar, select Assessments (1a). Find the desired assessment from the list in the Assessment Manager. Select the bolded Score Online icon (computer) (1b). Or, from the SchoolCity Launchpad, select the SCORE or ONLINE Flip Card (1c). On the reverse side, select Score constructed response/writing prompt items. Find the assessment you wish to score or click on More to go to the Assessment Manager (1d). Assessment Name, Subject, and Roster Year. Change Assessment: Click on the down arrow to select a different assessment. Filter students by Period, if appropriate, then click Refresh. Tabs for score By Student (default setting), By Item (See Step 7), By Groups (See Step 8), View Student Notes (See Step 9), if any were made by students while testing, and Score Review (See Step 10), a preview of how students have performed on each assessment item. Show Incomplete: Click here to show the student responses that have not yet been scored. Current Student Name displayed. Use the drop down arrow next to the student’s name to view the entire roster and select another student. Prev: Go to the previous student on the roster. Next: Go to the next student. Save: Click Save after scoring each student’s response to add the score to the student’s assessment results. It is recommended that you save often to avoid losing data. Download icon: Export Student Answers to PDF and print (See Steps 11-13). Score Points: Enter the score for each objective as set up by the Writing Prompt creator. Student Response: View the written response from the student. Copy to Feedback: Copy student response into Teacher Feedback textbox (See Step 4). Teacher Rubric: (See Step 5). Teacher Feedback (optional): Give feedback to students about their response. Click Save to save the feedback or click on the trashcan icon to delete. A Student Rubric may be attached during the Writing Prompt creation process, so students understand how their response will be scored. Students may write Notes for this item (if given as a tool by the Test Administrator) as they complete the Writing Prompt in the Student Portal. If the student has used the Notes tool, it will be highlighted yellow. Click on the appropriate icon to view each. As an option, the entire student response can be copied into the Teacher Feedback text box. Click on Teacher Feedback. It will change to orange and a text box will appear below. Click on the Copy to Feedback icon. This will add the student response to the Teacher Feedback text box. Write comments and use the CKEditor formatting tools as needed. Students will be able to review Teacher Feedback in the Student Portal if allowed to view the results of their assessment. Click Save to save your comments. Click on the T icon to view the scoring rubric for this item. Use the arrows in the bottom right hand corner to expand the window. Click and drag it to any spot on the screen. Click the X in the upper right hand corner to close the rubric window. 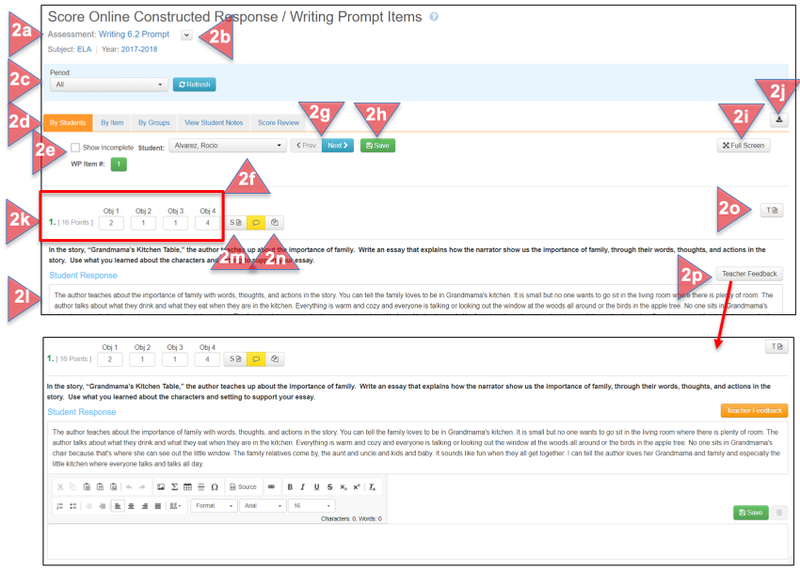 The full screen view offers another option for reviewing student responses and scoring them. Click on the Full Screen icon. Student Name, Prev, Next, CR Item Number: Use the Prev and Next buttons to move from student to student. Score points: Enter the scores for each objective. Student Rubric, Notes, Copy to Feedback: See above for more information. Student Response: View the student’s answer. Teacher Rubric: Click on the gray arrow to open the rubric. A split screen displays with the student response on the left and the rubric on the right. 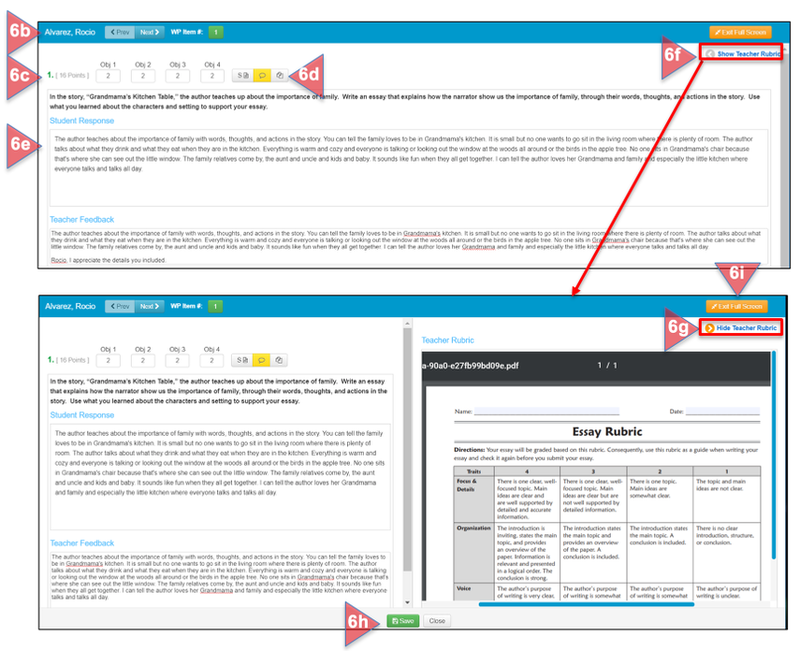 Hide the Teacher Rubric: Click on the orange arrow to hide the rubric. Save/Close: Click Save after scoring the response. Clicking on Close takes you back to the original screen. Exit Full Screen: Return to the previous screen. In this view you can see all student responses to the same item. Click on the By Item tab to view all student responses for this item. Points/Teacher Rubric/Student Rubric: See above for more information. Teacher Feedback to the far right of each student’s name to provide feedback to that student. Student Notes (if any) and Copy to Feedback (if desired). Save often to include student score in Reports. If student groups have been created in the Group Manager, a group may be selected for viewing and scoring. Click on the By Groups tab. Use the drop down menu to select the desired group. Click Refresh to view results. Read and score the responses as described above. View notes students wrote and saved about items during the testing session in the Student Portal. Click on the View Student Notes tab. Student Name: Click Prev to go to the previous student; click Next to go to the Next student on the roster. View notes By Student (default) or By Item (see below). See a preview of how students scored on all items on the assessment. Click on the Score Review tab. Student ID, Last Name, First Name, Objective Scores, Total, Percent Correct (blue bar graph). Each column can be reordered by using the up/down arrows in the header. Click one to reorder from lowest to highest score. Click again to reorder from highest to lowest score. Export results to PDF, Excel, or CSV. In the By Students tab, export the students’ responses to PDF format by clicking on the download icon on the right hand side of the screen. Select Items to Include: All Writing Prompt Items or only one. Select the Content to Include from the options shown. Select Print by Class or Print by Student. Click on Print. This will generate a PDF for printing. From the Assessment Manager, SCORE or ONLINE Flip Cards, find the assessment you wish to print. On the Score Online Constructed Response Items page, click on the download icon (Bulk Print PDF). Select Items to Include: all Writing Prompt items or a specific WP item. A message will appear confirming the bulk print request. Click Send to Bulk Printing or Cancel. A second message will appear confirming that SchoolCity has received the request and is processing it. Click Take me to Bulk Printing or Exit. Manage Bulk Printing: The Bulk Printing Manager shows the status of all Bulk Printing requests for Answer Sheets, Student History Reports, PDF Score Online CR Items, and Scope and Sequence from the Curriculum & Instruction module. Status/Delete: Each request displays the Requested By User Name, the requested date, the status, download icon, and delete icon. On the Launchpad, when there is a request requiring some action, a number will appear next to the Bulk Print icon in the Top Menu Bar. Click on the printer icon. Click on the PDF Score Online CR Items tab. A request that has already been downloaded will display as Downloaded in the Status column with a bolded black icon in the Functions column. It can be downloaded as many times as needed. A request that is ready to download will display as Completed in the Status column with a green download icon in the Functions column. Click on the green download icon and print as needed. Student responses can also be downloaded and printed from the Assessment Manager, when the assessment window is In Process (yellow) or Closed (red). In the Assessment Manager, find the desired assessment and click on the down arrow on the far right in the Functions column. Select PDF Student CR from the drop down menu. Make selections for Items to Include, Content to Include, Print By Class or By Student, then click Print. In Online Settings, if Show Item Details in Student Portal has been selected as a property for an assessment, then students may view the results of that assessment, including their score and Teacher Feedback for a Writing Prompt item. To access the scores from the Launchpad, click on the REVIEW SCORES Flip Card. On the reverse side, select the assessment to review. Or, click on Scores from the Top Menu Bar. 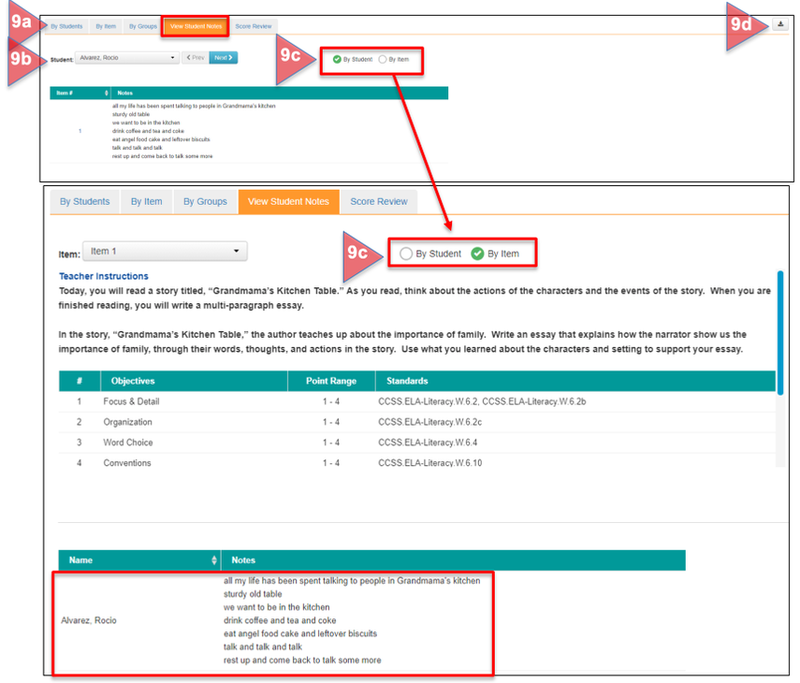 Select View Result (in blue type) next to the desired assessment. Overall score, Percent Correct, and Performance Level shown under the assessment name. Writing Prompt, Standards, Student Response, Total Possible Points, Score, Resources (aligned to standards). 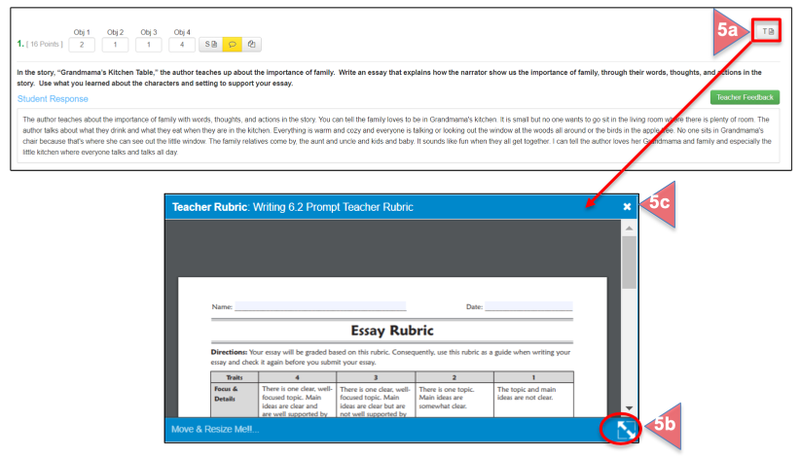 Click on WP under Student Response to show your response and any teacher feedback given. Click on WP (in orange) again to hide your response. Click on the Resources icon (globe) to access lessons aligned to standards. To learn more about scoring assessments in SchoolCity, see the guides in SchoolCity, Score Assessments.